This Monday, Evelyn and I with our girls went to Botanic Garden. It was my second trip there after my recent Saturday trip to Jacob Ballas Children’s Garden. This time we slow walked from Botanic Garden MRT to FFT which is from one corner of the garden to the other end. It took us about more than one hour to reach there. In between, our kids warmed up to each other, started to chase and play with each other. As we walked, Layla mentioned to her mom about this tree that she would like to climb. Not knowing where is this tree located exactly, we just walked on in the direction to FFT. Ahead of us, I finally saw in person this huge Tembusu tree, which is a popular spot for pre-wedding photoshoot and a natural playground for children to climb. This famous tree is also identified as one of the heritiage trees, at the Botanic garden. Layla and Dot dashed for the Tembusu tree. I’m amazed at how well and fast Layla could climb up the tree. Dot looked at Layla with envy but she is too short to even climb up the lower part of the branch. After some tries, she gave up and started to play with the dried leaves on the ground. I remember reading about the benefits of tree climbing for children some time back. 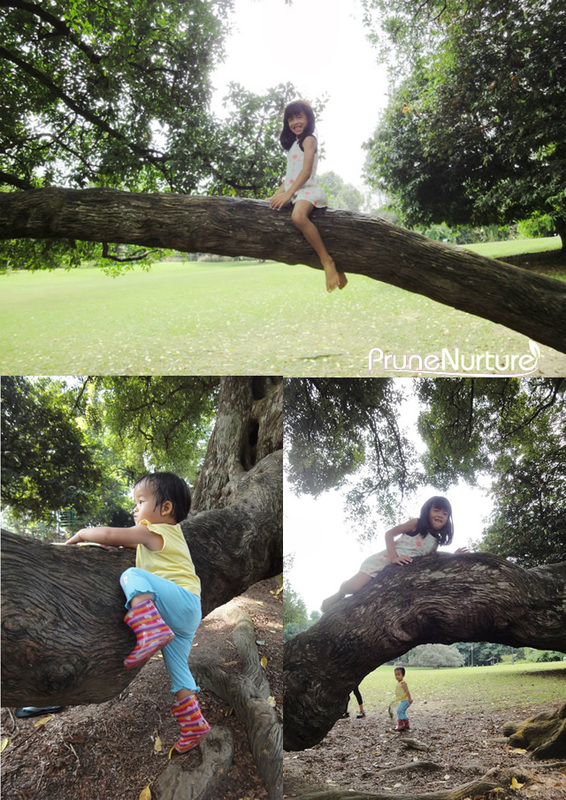 Tree climbing increases children’s resilience, ability to assess risks and make personal judgement. Taking physical risk helps them to be brave and it is the way the children learn. If there was a shorter tree, I would let Dot climb, would you? I love that Tembusu tree. My parents tell me they used to sit on that tree when they were dating, more than 35 years ago. Fancy that!